Sam Products Pvt. Ltd. has created a unique niche in the industry as a leading Manufacturer and Supplier of high quality range of Air Showers, Pass Boxes, Garment Cubicles. 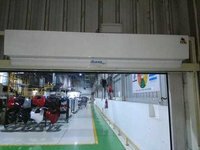 Air Curtain ...Air Curtain Biotek Engineers is manufacture, exporters & suppliers of : Air Curtain Air Curtain (Wooden with sunmica) : Size available are: 3’ 4’ 5' Note :Installation if required will be charged extra.